Insight from 2,020 farmers from across the country reflected enthusiasm for cover crops and—for the fourth year in a row—found a yield boost in corn and soybeans following cover crops. Multi-year data shows the yield boost increases as cover crops are planted year after year, a revelation that points to an appealing long-term benefit of the conservation practice. The survey offers data unavailable elsewhere, providing a vital glimpse into farmers’ use of and perceptions about cover crops: Previous SARE/CTIC Cover Crop Surveys have been used by researchers and farm groups, and even cited in Congressional testimony. The survey was conducted in March 2016 by the Sustainable Agriculture Research and Education (SARE) program and the Conservation Technology Information Center (CTIC) with help from the American Seed Trade Association (ASTA) and Purdue University. 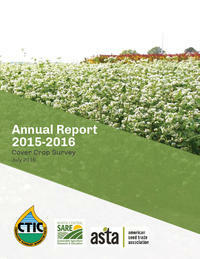 The full report is available online at www.sare.org/covercropsurvey. Acreage planted to cover crops continued its steady rise among survey participants, reaching an average of 298 acres per farm in 2015 and projected to grow to a mean of 339 acres in 2016. Those figures are more than double the acreage survey participants said they planted in 2011. Corn yields rose an average 3.4 bushels per acre, or 1.9 percent, after cover crops, and soybean yields increased 1.5 bushels per acre, or 2.8 percent. Analysis of the survey data revealed that yield increases rose to 8.3 bushels per acre of corn after cover crops had been used for more than four years on a field. In soybeans, the average yield gain increased from 0.1 bushel per acre after a single year in cover crops to 2.4 bushels after four years of cover crops. The modest average gains reported for 2015 are in line with agronomists’ expectations for a good growing season, says Rob Myers, Regional Director, Extension Programs for SARE at the University of Missouri. “Cover crops really shine in challenging years, when the improvements they influence on soil moisture holding capacity and water infiltration can minimize cash crop yield losses to stress,” Myers notes. “In a favorable growing season, we expect to see less of a yield impact. However, the link between the length of time in cover crops and yield improvements points to the long-term benefits of building soil health. Myers added that a mild surprise in this year’s survey was how many farmers reported a profit benefit from cover crops. Of the farmers surveyed, 33% found their profit improved as a result of using a cover crop, while only 5.7% said their profit decreased; remaining responses were split between those reporting no change in profit and those not yet having enough data/experience to evaluate profit impact. Cereal rye was the top species of cover crop planted by survey respondents, planted by 82% of the group and covering 187,044 acres among the participating farmers. A majority of respondents—52%—reported that their soybean yields always or often rise after a cover crop of cereal rye; less than 4 percent said their yields sometimes or always decreased after rye. Cereal rye cover crops also proved helpful in other ways, with 82% of farmers reporting that the rye helped with weed management—including 26% who found it also helped with tough herbicide-resistant weeds. Crimson clover was the most widely planted legume cover crop, while oilseed radish is the most common Brassica (mustard-type) cover crop species. Farmers were asked what would help motivate other farmers to adopt cover crops or increase their use; the top-ranked response was tax credits, followed by getting a discount on their annual crop insurance premium payment. Cover crop mixes are gaining popularity. In all, blends of species were planted on nearly as many acres as cereal rye among survey respondents. Most—61%—said they designed their own blends, while 22% rely on advice from their cover crop seed salesperson or crop consultant for advice on mixing species. 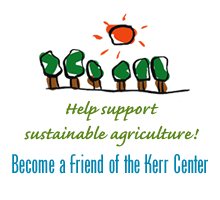 SARE, CTIC and ASTA received support for the project from Penton Farm Progress magazines, Albert Lea Seed, CHS, The CISCO Companies, LaCrosse Seed, Mountain View Seeds, Allied Seed, Curtis & Curtis Inc., Grassland Oregon, Justin Seed and Seedway. The full report is available online at www.sare.org/covercropsurvey. Two new studies show the beneficial effects of both cover crops and crop rotation on soil health and quality. These practices boost beneficial soil microbes and enhance the soil’s ability to withstand weather extremes like drought and flooding. Soil health practices such as cover crops and no-till can result in an economic return of over $100 per acre, according to a set of case studies jointly released by the National Association of Conservation Districts and Datu Research, LLC. Cover crops and no-till can limit soil loss, reduce run-off, enhance biodiversity, and more. Naturally, farmers who are considering adopting these practices are keen to know how they will affect their farm’s bottom line.